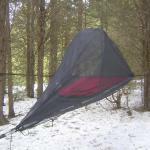 Using our "Solo+" base footprint — same as our Expedition Grade Aelph-Alphas and other Solo+ models, Treez Tree Tents brings you a fully poled, completely weatherizable, fully enclosable Treez Tree Tent…and at an entry level price…yes, simplified, but with the same quality of advanced materials and handwrought workmanship as our Expedition Grade Tree Tents. 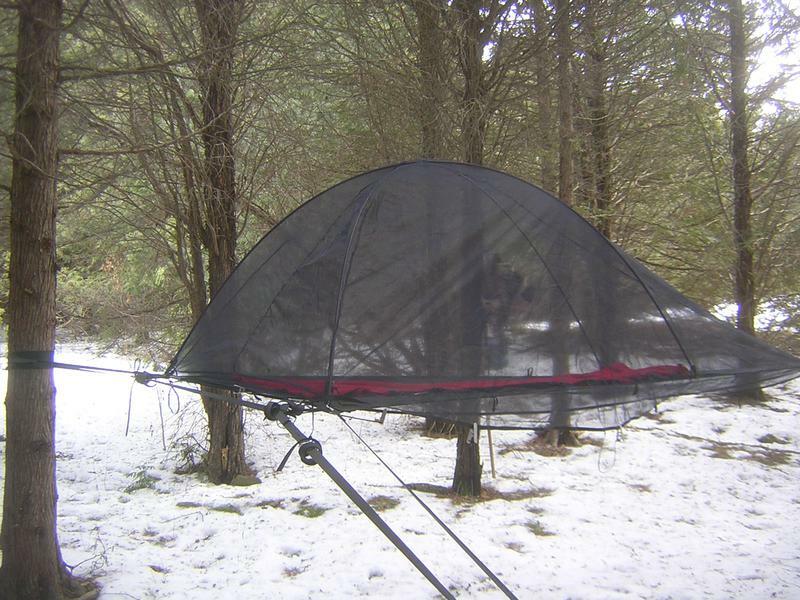 Add our Accessory BugNet for buggy conditions and you have all the essentials for the stable, level, off-the-ground comfort and adventure as our very sophisticated Expedition Grade Alpha and Omega Treez Tree Tents! 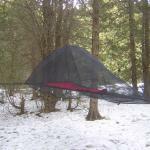 Sleeping/Camping Web-Tensioned Base with all needed gear and new Web Tensioning System; extremely VERSATILE(!) and ready to set up at thousands of sites — and yet expandable to even more; with our Custom Tailored SilNyl, ultralight, ultrastrong, ultra water resistant, huge Fly/Canopy/Tent with full pole system providing seating, even kneeling, height with room for an overhanging LED light, etc. ...Or bought as a full, initial package: $489! Explore our Thumbnail Gallery (Click on each to expand—the, "Slideshow" through all if desired) of the new ST-2. All of these shots are actual and were made in a nearby deer yard with a few inches of hard pack snow left. You wouldn't need our BugNet in this weather, but we wanted to premier the many facets of our new ST-2. 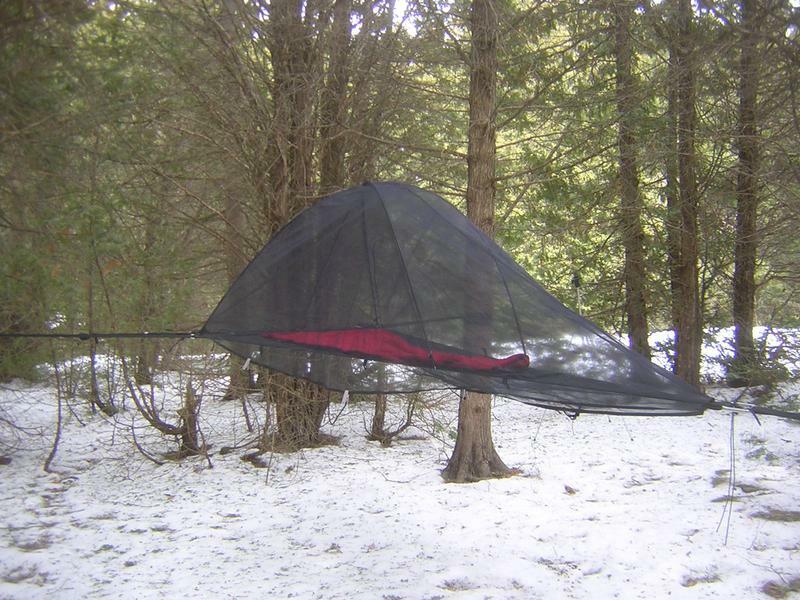 Soon, it will be granting bug free suntans and nighttime "Star-Canopies" or under-Canopy bug resistance for those deploying it. 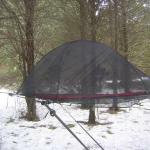 Come July, you may want to add the BugNet, as shown here, under our Fly/Canopy! "To Order" list? Chosen your colors? HeadSide tied out to local branches as an entry hood. Just look at the volume of the ST-2! A bonus over even our full Alphas and Omegas: Entrances and Exits can be planned and executed from every side and angle; helpful in high or unusual settings. "Take your shoes off in the house!" "But, it's cold out there, ma!" Just to show you a perspective of interior volume. Use and Storage Space, behind a provided "bootstrap" extends for several feet beyond my hiking boots. Overhead spans on up the poles to well over average sitting height (even kneeling height! ), depending on movement and load, and leaves room for an overhead LED light without hitting your head on it…much, if ever. 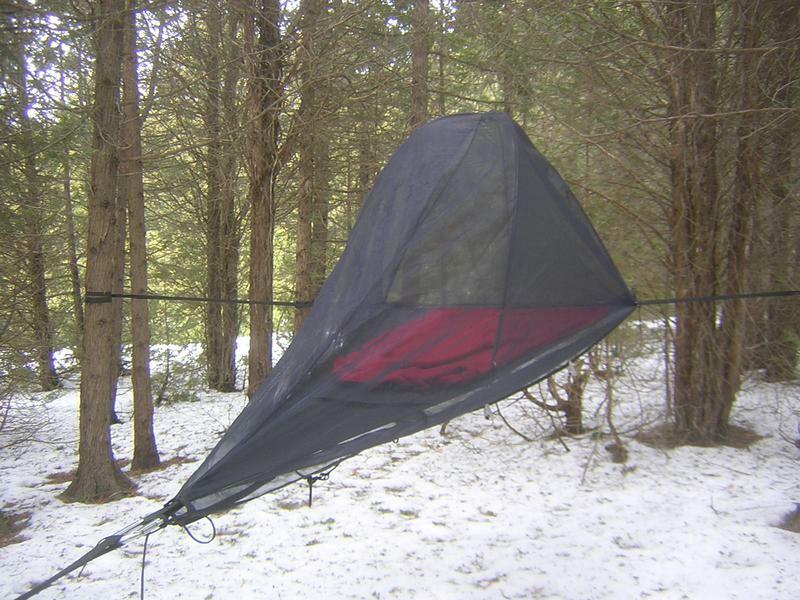 Our BugNet may be used freestanding for tans in the daytime and as a "StarCanopy" at night, as well as deploying it under the Fly/Canopy. See photo at right and the ST-2 galleries.